The truly great trends eventually become classics. Such is the case with skinny jeans. They have reached the status of being a classic style that will be around for awhile, worn by both men and women (as shown by Adam in the photos). The major innovations are in place. Looking forward we are likely to continue seeing primarily cosmetic variations such as: different washes, frayed vs hemmed legs, inseam lengths, levels of distressing, button fly versus zipped fly, and rises. This is also one of those cases where men followed the lead of women in adopting this style and even wearing jeans styled for women, as you all know. As an early adopter of skinny jeans, I feel it is time that I and other male trendsetters take a deep breath, relax, and savor the moment with the knowledge that we’ve played a role in making skinny jeans the iconic style that they have become. Of course we’ve had help from blogs such as ‘The Jeans Blog’ as I list some of the memorable articles: Women’s Skinny Jeans for Men, 10 Ultimate Super Skinny Jeans for Men, Celebrity Men Wear Women’s Jeans, The Best Women’s Skinny Jeans for Men, 15 Really Tight Super Skinny Spray On Jeans For Men, and Hudson Barbara Skinny Jeans Double Review for Men & Women. AG’s ‘The Mila’ Jean is a lightweight denim with a 98% cotton content. 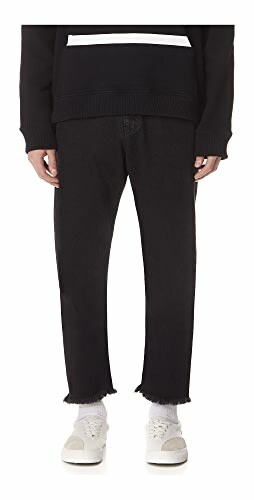 It is relatively stretchy and I’d suggest sizing down for a good fit. It has a snug fit but is a bit more roomy about the thighs than the other jeans, making it very comfortable for long periods of wear. 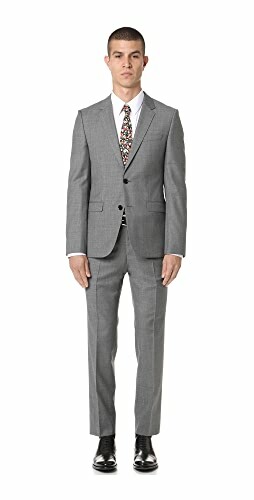 Critical dimensions include a 12″ front rise, 14″ back rise, 10″ ankle opening and a 29.5″ inseam. It comes in 4 different washes. What is pictured is ‘Overdye Blue’ wash. I also have a pair in black. 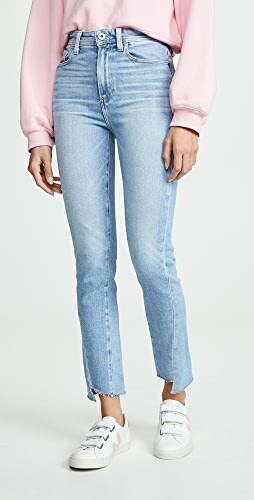 Citizens of Humanity’s ‘Chrissy’ Jean is labeled as their “Uber High Rise” jean and it did have the highest rise measurements at 12″ for the front and 14.5″ for the back. 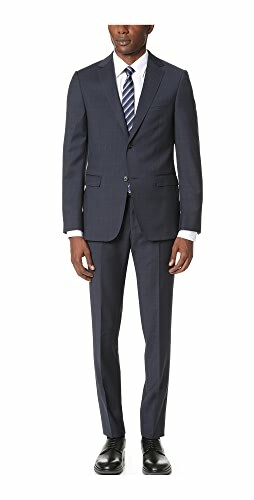 Its ankle opening of 10.5″ and inseam of 29″ produce a fit that can best be characterized as a higher waist version of their iconic Rocket style. It is made with a medium weight denim having an 87% cotton content. It fits true to size and doesn’t stretch out. It is pictured in the ‘Hotpoint’ wash and comes in two additional washes. Levi’s Made & Crafted ‘Sliver’ Jean is made with a heavier weight denim with 92% cotton and fit true to size. Of the jeans covered in this article, it is easily the skinniest jean with a legging like fit and an ankle opening of 9.5″. 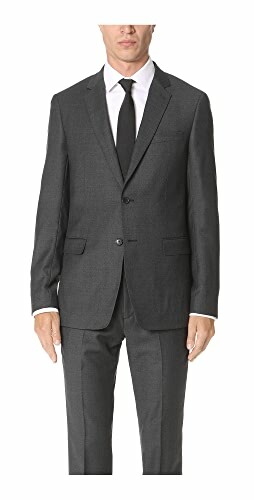 It also has the longest inseam at 31.5″ and may need to be cuffed or hemmed depending on individual preference. Rise is fine at 11.5″ in the front and 13.5″ in the back. It should be noted that these jeans had the shallowest front pockets. If you are looking for a legging like fit, these are definitely worth a try. It is pictured in a medium blue wash called ‘Worn’. Rag & Bone’s ‘Dive’ Jean is made from a medium weight denim having a cotton content of 98%. It is similar to the Levi’s jean we just discussed and also fits true to size. The rise is identical and believe it or not the name of the pictured wash is the same (Worn). It is the differences that won me over. First off, with a leg opening of 11.5″ it is a true skinny jean and not a legging. It has a 29.5″ inseam negating (at least for me) the need for cuffing or hemming. Best of all it fits great, feels great, and has deep front pockets for a women’s jean. 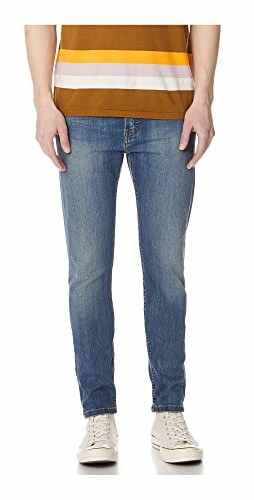 Rag & Bone’s ‘Lou’ Jean is another heavier weight denim jean with a 98% cotton content. It is tied for the highest rise with the CoH Chrissy coming in with 12″ for the front and 14.5″ for the back. It has the largest ankle opening at 12″ and a longer inseam at 31″ (uncuffed). I may have saved the best (at least for me) for last. The heavier weight denim provides the feel of a traditional denim jean without the restriction of 100% cotton denim. The slightly looser skinny leg makes it great for casual wear to do just about anything in. As you can tell by the washes pictured in the other jeans, I’m a big fan of medium, somewhat darker washes. 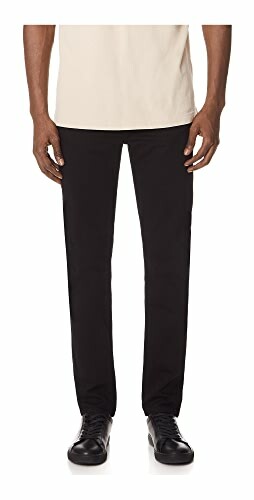 Of them all, Rag & Bone’s ‘Northwood’ is my favorite wash with minimal highlighting to detract from the classic look and fit. It was my intention that this article makes you aware that 1) skinny jeans are now considered classics which means they will be around for quite a while and 2) that there are women’s styles you may want to consider which fit that classic mold. But be aware, as a pair of jeans becomes a classic style, perhaps even an icon, brands quite often become complacent and go into maintenance mode doing just enough with new washes and cosmetic changes such as distressing and raw hems to keep their customer base while their primary focus is on discovering and building the next trend. So what is the next trend? Will it have the legs (pun intended) of the classic skinny jeans? Is it tapered jeans? Are men ready for cropped jeans? Will there be a resurrection of the baggy gangster jeans from years ago? What styles would you like The Jeans Blog to explore further in pursuit of the next iconic trend? As usual, we are humbled by the collective wisdom of our readers and appreciate your feedback and input. – 2 main images courtesy of Your Average Guy Style wearing women’s skinny jeans. It’s a good thing you mentioned crop jeans. I think if you find a good style, men can wear them and I find them more comfy than regular shorts, since it’s made with the same skinny jeans stretch material. I never liked the way men’s denim shorts look and feel, and regular women’s shorts are way too short, but I discovered that bermuda length or crop look convincing on a male, because they have a longer length similar to men’s shorts or longer in the case of crop. I like to think ahead, so I’m not going to wait for it to get mainstream in America, I’m wearing them now! You are so right. As skinnies are now a classic style, it’s not unexpected that men and women’s styles will become very similar some of which were highlighted in Lorna’s article on “15 Really Tight Super Skinny Spray On Jeans For Men” which can be found at http://thejeansblog.com/jeans-advice/15-really-tight-super-skinny-spray-on-jeans-for-men/. By no means did I mean to infer that women’s jeans were the only option. I’m interested in trying Topman or Brooklyn Jeans if I can find a pair at a local retail outlet. I have a pair of Levi’s 519 but was not impressed. The rise was too low and the fabric wasn’t flexible enough to meet my preferences. Tim, Thanks for tip on the Levi’s. I was tempted to try a pair but I will stick with Topman And Dr. Denim.I have seen two new brands showing up on Instagram; Pre’ London , and Luxe London that look great but need more info. Ricky, if you are thinking of trying Levi’s, if you don’t mind the button fly, the 501 skinny could be an option. Great fit and feels like real denim. What I’m thinking of is something for warm weather wear which is longer that shorts but is noticeably above the ankle. Perhaps from just below the knee to bottom part of the calf. 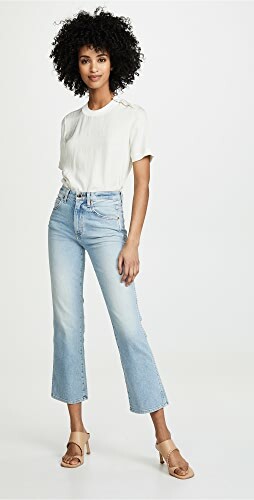 In my searches so far, all that I’m finding for men are basically regular jeans, whatever legs style with a somewhat shorter inseam which really isn’t what I’m looking for. Other than Bermuda shorts, have you found brands offering other styles that might work? Sadly men’s styles are limited, you might have to get women’s jeans. 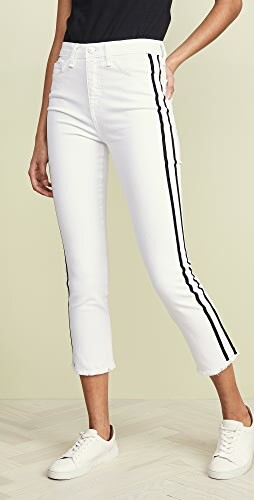 Women’s jeans have a style called ankle jeans, so they end at ankle length, they have different styles from hemmed jeans, with zippers, cuffed or just a plain regular skinny jean but with a short inseam. Be wary that as a guy the jeans ,might look shorter since men are typically taller than women. Here’s a picture just to show you a tiny example. Shop Sleeveless Dresses, Red Maxi Dresses, Cutout Dresses, Black Leggings and more. Get this widget.